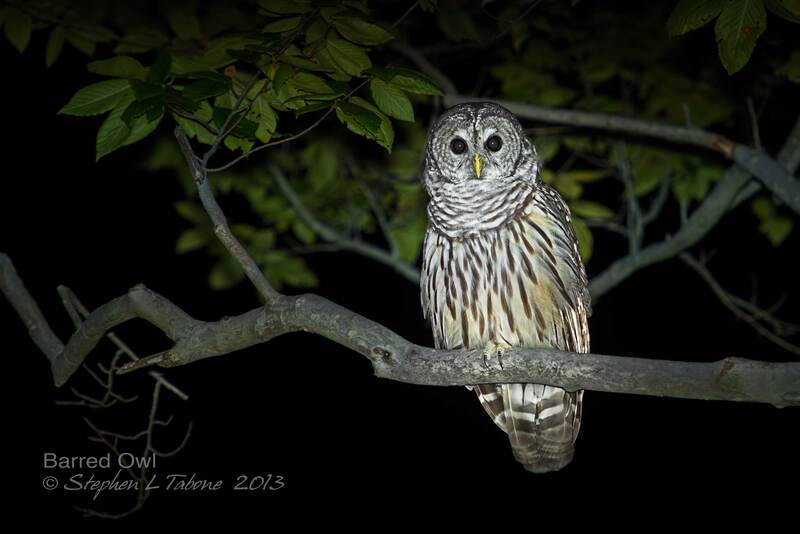 Over the summer, the Barred Owls that live around the lake where I live have been very active. There are two mated pairs and at least one offspring that I have seen and photographed (previous blog article). Every evening, when I am outdoors or have my windows open, I can hear them hooting back and forth at dusk. They are very loud, and for me, it is thrilling to hear their enthusiastic calls. Recently, at dusk and early evening, the owls have been venturing further than usual from the heavily wooded areas across the lake and closer to my home. I was able to photograph one of the owls over the weekend and was excited to get the shot and posted it to Facebook. It was totally dark and very challenging to get that image due to its distance, branches that covered parts of the owl at times, and getting the settings just right on my camera and flash. Nevertheless, I was pleased to see the owl and get the less than perfect shot. For me and most nature photographers, the “perfect shot” is one that is sharp, properly exposed with no noise, and well composed, and getting such an image in total darkness is very challenging. The image was taken with a Nikon D800, 70-200mm lens with a TC20 teleconverter at 310mm, at f/5.6 and ISO 400, and using a Nikon SB900 Speedlight with a Better Beamer. This image will be hanging on one of my walls very soon. This entry was posted in Bird Photographs, Nature, Wildlife and tagged Barred Owls. Bookmark the permalink. I love this shot – it looks “perfect” to me! You might want to try a metallic print – I have been very impressed with the results so far, and it really makes the colors pop on a gorgeous shot like this. Thanks! I just might give them a try! Thank you Pam–It was a challenge to get the shot. I was shooting both the camera and flash in Manual mode and barely could make out the owl’s silhouette in the viewfinder, which made the image even more special. Yes, it makes the success all the sweeter. If you keep this up we won’t have to take any more trips. We’ll just come over to your house, sit on the balcony, drink beer and get to take great images. Very nice Steve, thanks for sharing it with us. I will miss all of the wildlife I see and shoot from my back deck and on the lake when I move. It will be hard to replace. You need to come over for a shoot on the lake one day. Poor Bird!!! Some Virginny nut out blinding the poor thing; You do know that he/she will get even!! Ha! I enjoyed your comment. I noticed the owls are now wearing sunglasses when they see me out on my back deck at night. Beautiful picture – owls are just fascinating! Love this owl! What a great photo (as always)! Excellent capture, Steve! The detail really shows when enlarging the photo. Thank you! I just uploaded a different owl image image that is even better than the one you saw (previously in the blog article). Check it out, and let me know how the detail looks now. Super! Oh, for such a an opportunity! Until I have one, I’ll surely enjoy your photos. Photographed at sunrise on the Carabelle River in Florida. You may copy and use any images on this blog for personal purposes such as on your blog, Facebook page, desktop image, etc. as long as you indicate that I am the photographer and provide a link to my website. All other uses, such as for commercial purposes, are subject to licensing arrangements made with Stephen L Tabone.